The lecture is open to all but please register by completing this form until November 24, 2017. 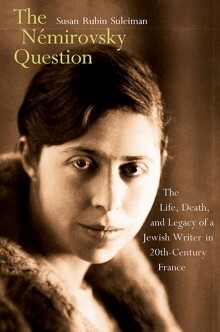 Susan Rubin Suleiman will discuss her new book on Irène Némirovsky (1903-1942), a Russian Jewish immigrant to France who achieved a brilliant career as a novelist during the 1930s but was deported as a “foreign Jew” in 1942 and died in Auschwitz. Némirovsky’s tragic fate mirrors that of many assimilated Jews in Europe who had abandoned Jewish religious practice, or even converted to Catholicism, only to be treated like all other Jews by the Nazis. Némirovsky’s portrayals of Jewish characters in her fiction are controversial, for some readers consider them to be antisemitic. Suleiman argues instead that her Jewish characters exemplify the dilemmas and contradictions of Jewish existence in the 20th century, in Europe and beyond. Susan Rubin Suleiman was born in Budapest and emigrated to the U.S. as a child with her parents. She has been on the Harvard University faculty since 1981, where she is currently the C. Douglas Dillon Research Professor of the Civilization of France and Research Professor of Comparative Literature. Her many books and edited volumes include The Némirovsky Question:The Life, Death, and Legacy of a Jewish Writer in 20th-Century France (2016), French Global: A New Approach to Literary History (2010), and Crises of Memory and the Second World War (2006). In addition to her scholarly work, Suleiman is the author of Budapest Diary: In Search of the Motherbook (1996), a memoir about Hungary.